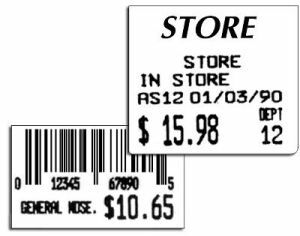 Choose from a variety of Thermal Transfer Labels and Ribbon to mark your merchandise in your retail store. You can print labels that are either designed to be Direct Thermal or Thermal Transfer. Thermal Transfer (TT) means these labels are used with ink ribbon (sold separately). The ink gets transferred from the ribbon to the plain paper labels.